The 50/50 series was first introduced back in 2009. This is the first batch released since late in 2011. The unique factor with the 50/50 is exactly what its name says. 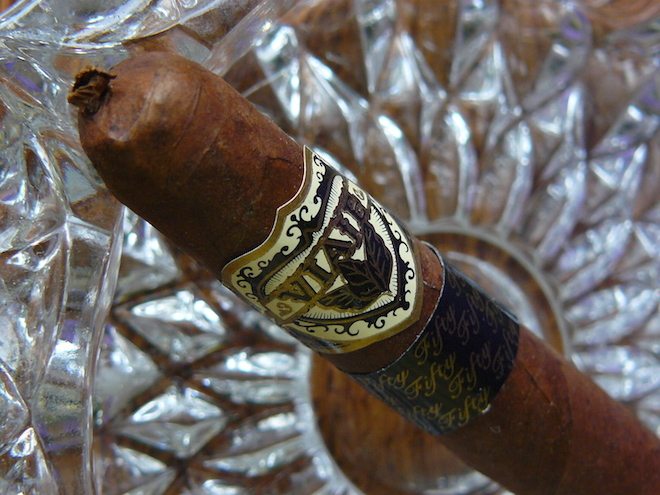 The cigar contains two different filler blends – one filler blend in the first half and one filler blend in the second half. Farkas has told us in the past that this project is an enormous undertaking. The 50/50 is made available in two distinct overall blends – the 50/50 Red and the 50/50 Black. The Black is considered to be an amp’d up version when compared to the 50/50 Red. Both cigars are Nicaraguan puros. For the previous releases of these specific lines, the cigars have contained a Nicaraguan Corojo wrapper and each were made available in three front marks. The sizes they come in are No. 1 – 5-5/8×46, No. 2 – 6×50, and No. 3 – 7×47. Since I bought these recently, I have to assume that these are from the 2013 release, as I haven’t seen anything about any subsequent releases. The Viaje 50/50 Black comes draped in a medium brown matte wrapper with darker mottling and a slight tooth. It is firmly packed, with some softness at the foot when gently squeezed. Its nearly invisible seams lead up to a triple cap with a short, but slightly off-centered pigtail (not that it’s going to matter once it cut it). The scent off of the wrapper is a very light barnyard, while the foot shows some mossy tobacco and a little earth. Clipping the cap reveals a snug draw with a vague sweetness, but not much else. The first puffs show some rounded cedar notes, earth, pepper, and a bit of that so far unidentifiable sweetness. The 50/50 Black is starting on the mild side with some waviness in the burn. The earth soon backs down to showcase more of the woodiness and sweetness. At this point, I’m having trouble deciding whether it’s a fruity or spice sweetness, but the end of the retrohale, it’s more like a light cocoa powder. Although the burn is razor sharp, it continues to be a little cockeyed. An inch in, and the sweet cocoa has deepened and the brownish-gray ash tapped off, as it was beginning to droop. Subsequent ashings would tend to be at about an inch and a quarter. The mouthfeel has turned creamy and the pepper has dropped considerably, even as the body of the cigar has risen to medium. Nearing the half-way point, the cedar has again taken the helm and the body has surprisingly backed off to almost the mild range. When I hit the half-way point, a savory and slightly bitter herbaceousness has emerged and the pepper has begun to rebound. The burn has evened out without any assistance, and the body has once again crept back up to medium. The wood is now more of an oak, and the sweetness on the back end wavers between cocoa and baking spices. 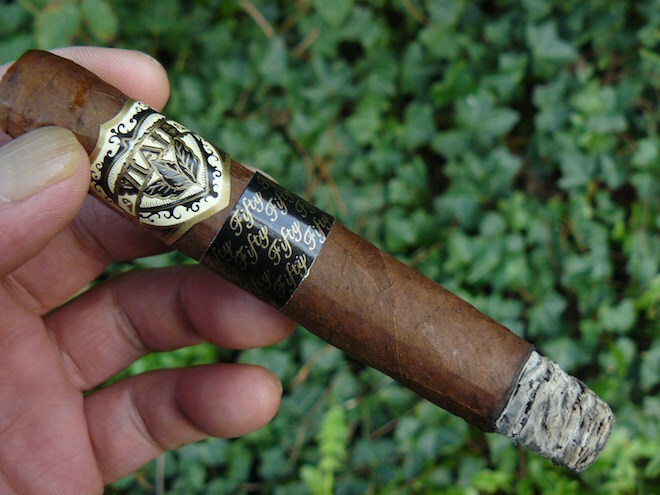 The Viaje 50/50 Black has now moved up toward medium-full and the flavors have become darker; more savory and less sweet. With about 1-1/2” left, the flavors have become more coffee-like, with the wood and light earth playing more of a supporting role. This continues down to the nub, with the flavors not changing much, but strengthening toward the end. 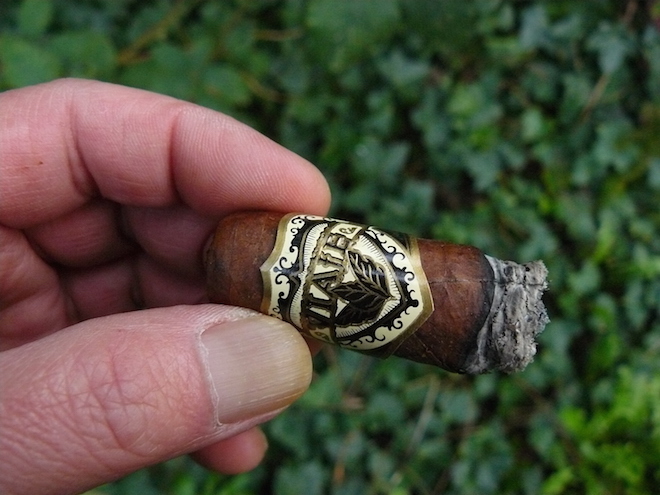 I am not well versed on Viaje cigars, with my previous experience being a single Exclusivo corona gorda and another 50/50 Black that I had smoked a couple of months ago, but I did enjoy this cigar. I’m not sure that it really provided the experience that was intended, since many cigars will provide change ups without the rather arduous task of rolling two different fillers in a single stick. Be that as it may, it was a good smoke, and I would gladly light up another one, although I may not actively chase it down. 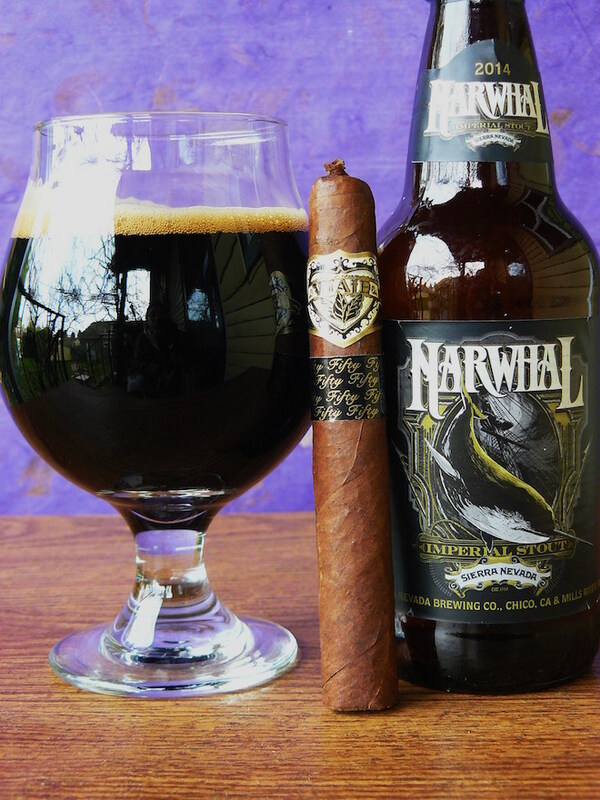 Chico, California based Sierra Nevada’s Narwhal Imperial Stout is a seasonal brew that sports a hefty 10.2% ABV, with a slightly lighter than expected body, but big flavors out of the gate of sweet roasted coffee maltiness and a nice balancing hoppy bitterness. Dark fruits also come into play, along with chocolate and some booziness. Although I was a little concerned that the beer would overwhelm the Viaje 50/50 Black, its great balance allowed it to match very well with the cigar, and helped to bring out an added amount of sweetness and depth from the 50/50. This is truly an outstanding stout, cigar or not. I think this cigar would also pair well with other sweet stouts, as well as a rum that is on the sweeter side. And of course, a lightly sweetened coffee – what cigar doesn’t go with coffee?